parasite, shown here in purple [Credit: Eric Fortin, flickr.com]. The origin of the maxim, “the best defense is a good offense” has been lost to human history, but this principle extends beyond armies and athletics, to microbes. Chemicals derived from microbial defenses are leading to new antibiotics beginning with one to fight malaria, which causes 500 million annual cases of infection world wide—one million of which end in death. Metcalf and his team at the University of Illinois have isolated a gene in a common type of soil bacteria that controls the production of an antibiotic known as FR900098, which is effective against the malaria parasite. By cloning this gene and inserting it into an easily manipulated bacterium E. coli, the team created a tiny biological factory. Metcalf’s research focuses on exploring new classes of drugs derived from bacteria by examining a microorganism’s DNA. “If there is an Achilles heel out there in any bacteria, it is likely that nature has already discovered it,” he says. The hope is that these custom antibiotics will be effective against many diseases. Over 70 percent of the antibiotics in use today, including penicillin, have been isolated from microorganisms. Malaria has become increasingly resistant to the most common treatments, contributing to fears that we may run out of affordable measures to counteract the disease, says Dr. Ronald Waldman, an epidemiologist at Columbia University, who specializes in children’s health in developing countries. Discovering a drug that attacks the malaria parasite in a new way would greatly reduce the organism’s ability to adapt to new therapies, especially when combined with current treatments. Another cost-effective weapon in the arsenal against drug resistance “would be huge,” says Waldman. The story of FR900098 began in 1980. This little compound with the unwieldy name (FR stands for Fujisawa Research, the Japanese pharmaceutical company that discovered the compound) was identified as an antibiotic and isolated from a common type of soil bacteria known as Streptomyces rubellomurinus. At the time there were many effective antibiotics available, and the compound was shelved. 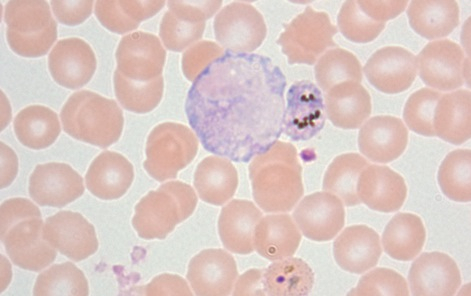 However, in 1999, a team led by Hassan Jomaa of Giessen University in Germany, discovered that FR900098 acted on a pathway characteristic to the malaria parasite, and it cured the disease in animal testing. Currently, FR900098 can be created using chemical processes in the lab, but the cost is ultimately tied to the price of the required chemical building blocks, which can be quite expensive. However, during biological synthesis, basic sugar, or glucose, is the only input mini-bacteria factories need, and “glucose is one of the cheapest things to make stuff out of,” Metcalf points out. This could lower the antibiotic’s price to a reasonable level for use in the developing world, which would need to be about a dollar a dose. The Illinois team is not there yet. “We are still working to make this more efficient,” says Huimin Zhao, a biochemical engineer who works with Metcalf. Zhao is optimistic that the process can be refined to the point where industry will show interest and use the process to create FR900098 cheaply on an industrial scale. From humble beginnings in the soil to an inspired campaign against malaria, FR900098 is currently undergoing human trials in Africa. If all goes well, it will become the first of a new class of drugs with its sights set on neutralizing this devastating disease. A malaria vaccine edges closer to reality. Video: How to breed mosquitos. Can one drug treat both HIV and malaria?